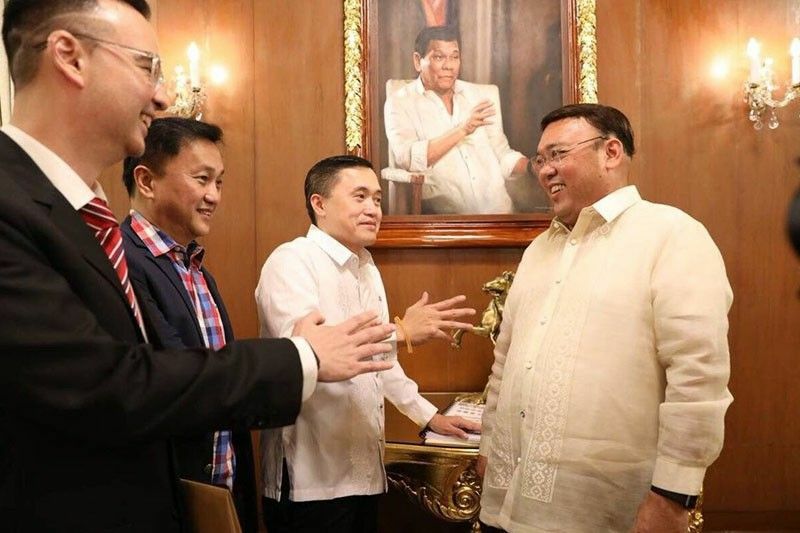 Presidential spokesman Harry Roque with fellow Cabinet secretaries on Monday, October 8, the day he said he was on indefinite leave. MANILA, Philippines — President Rodrigo Duterte said he was willing to let go of Harry Roque Jr. when the presidential spokesperson informed him of his decision to resign. Speaking to reporters at the Malacañan Palace Tuesday, Duterte said his mouthpiece is bent on pursuing his Senate bid in the 2019 midterm polls. “Kasi hindi ko man maintindihan. So I’m giving him that margin of safety. Kasi sabi niya mag-resign siya because he didn’t know that I was in the hospital. Hindi naman kailangan sabihin ko lahat eh. There are things which are limited to the immediate members of the family,” the president said. Roque earlier threatened to resign after being kept “in the dark” about Duterte’s recent hospital visit. He said he would need the weekend to ponder. On Monday, Roque’s staff announced he had gone on an indefinite leave. He, however, attended a Cabinet meeting on Monday night and handled a press briefing on Tuesday. “Sabi niya, mag-resign siya. Sabi ko ‘di sige. Then immediately I… namili na kaagad ako ng replacement but I cannot tell you now kung sino sila,” Duterte said. During the press briefing Tuesday, Roque said his decision to run for senator would be based on the outcome of his talks with the chief executive. “We’re still talking. I talked to the president yesterday afternoon. Talks have not been concluded. We will continue with our conversation,” he said. Last week, Duterte said he had told Roque to quit his Senate plan and offered him a new job as he said the former human rights lawyer would not win in the polls. Presidential Communications Secretary Martin Andanar confirmed that Roque was offered to lead the Office of the Press Secretary, which is said to replace the PCOO. But the chief executive on Tuesday night said he was eyeing Chief Presidential Legal Counsel Salvador Panelo to be his press secretary. “I did my homework very fast. Nung sabi niya na hindi siya tatakbo… takbo, namili na kaagad ako… Siguro I’ll assign in temporary or in added function. Tutal taga-announce man lang ‘yan si Sal Panelo. With all sartorial elegance, medyo maganda siguro tignan,” Duterte said. This leaves Roque’s fate under the administration uncertain. “Kaya naipit nga si Roque. It’s not my fault actually. Sabi niya tatakbo siya. Hindi tatakbo. Tatakbo,” Duterte said.